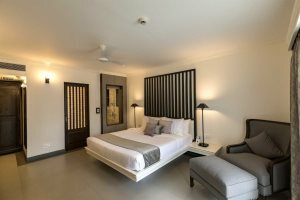 A charming hotel which opened in June 2018, this stunning boutique resort is just 400m from Calangute’s long sweeping beach. Idyllic for those in search of a very comfortable beach holiday in Goa, Andores Resort & Spa is located in the north of the state, set just back from Calangute’s golden sandy beach. Boasting a peaceful setting encircled by swaying palms and lush lawns, the resort has a distinct boutique style throughout, including its 25 guest rooms. Using fresh white and grey tones, the rooms are stylish yet comfortable, all with balconies overlooking the inviting pool and well-kept gardens. Guests can even choose from the hotel’s pillow library, ensuring maximum comfort during a stay here. As you’d expect from a boutique style hotel, you can enjoy a variety of top-quality facilities. The large pool has both poolside and sunken loungers to relax upon, and the Kera Spa offers a variety of treatments stretching from traditional Ayurveda, through to Western and Eastern-inspired techniques. Dining comes in the form of two restaurants, Diva and Cinnamon, with the former serving delectable Italian dishes and the latter offering a variety of regional cuisine, together sure to satisfy even the most discerning of guests. During your stay, be sure to also pay a visit to the pop-up store, where local designers, artists and photographers showcase and sell their beautiful wares. Andores Resort & Spa is in a superb location just a short stroll from the southern end of Calangute Beach, where guests will discover a variety of colourful beach shacks serving tasty Goan food and chilled drinks, as well as offering sunloungers for hire. Goa’s wonderful heritage is also easy to explore from here, as just 15km away is the capital, Panjim. With its Latin Quarter and ample heritage homes to uncover, there’s much to learn about the state’s eclectic history, conveniently close by. Deluxe Rooms are 35m2 featuring a double bed with signature bedding and pillow library, smart television, shower room and balcony or patio. Most of the bedrooms look towards the pool and gardens.